Thanks to digestive bitters, I’m feeling a bit better after an indulgence of Halloween treats (and prepared for the food-heavy holidays to come!) I usually don’t feel the bloating and indigestion that can accompany eating gluten, dairy, and sugar but even my digestive tract has its limits. I credit my healthy digestion to years of mindful healthy eating and bitter herbs. After two decades of ill health and almost constant antibiotic use, I was advised by a medical doctor to temporarily go on a Candida diet and to start taking herbal medicine to improve my health. I know it’s not usually the recommendations of a medical doctor, but I am glad I listened! Since that appointment, I have become an herbalist and acupuncturist and have been taking “digestive bitters” for almost twenty years. I’m happy to say now they are all the rage, and with good reason! Many of our digestive issues like gas, bloating, diarrhea or constipation, and even hemorrhoids could decrease from taking bitter herbs before meals. In Chinese medicine, bitter herbs clear heat and toxicity and dry dampness, making herbs like Skullcap and Gentian perfect allies to stimulate digestion, transform nutrients, and maintain the integrity of the cellular membranes of our intestinal tract. Digestive bitters are easy to make and these Tangerine Bitters is one of my favorites to make and to take! Add all ingredients to 8 ounces of Organic Vodka. Cover with lid and store in dark, cool location. Shake daily for 2-4 weeks. Strain out herbs and store liquid in dark colored, glass container. Take 8-10 drops of tincture diluted in 1/2 ounce water before each meal to prevent indigestion and reduce gas and bloating. This can also be sipped as an aperitif or digestif. I’d love to hear how this recipe worked for you. To learn more about herbalism and aromatherapy, check out my website. Jessica Baker, LAc, RH (AHG) is an author, acupuncturist, herbalist, aromatherapist and educator. Her passion for all plants is reflected in her formulations, private practice and classes on aromatherapy, herbalism, and Chinese medicine. 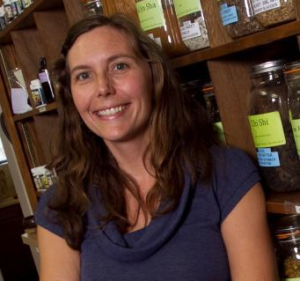 As a continuing education provider, she teaches at several herbal symposia and conferences throughout the United States. Jessica is on the faculty of the Holistic Cannabis Academy and The Colorado School of Clinical Herbalism. Having many years experience as a clinician, Jessica is a master formulator, understanding the importance of plant synergy and energetics.